Good seeing you at the first track practice today. What a great weather to kick off the new track season. Even greater were the pre-workout drills by our own Aaron Castillo. Thank you, Aaron! And thank you, Carlos Borrico for taking this picture! Reggie Snowden had already finished and left the track. Oh, Phil Aguilar was there earlier, too! Judging from the track workouts, everyone is ready to start training for the Gay Games. That’s fantastic! There were a few announcements today. All-comers meets – If you want to assess your fitness level and get your competitive juice flowing, try one of those all-comers meets. 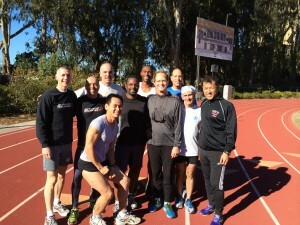 Los Gatos all-comers already started and will be held every Saturday until Feb 22. UC Berkeley also offers three all-comers in January and February. Check out our Events page for more details. San Francisco Bulls LBGT night – LGBT night at the Bulls will be held on Sat., Jan 11. Tickets are available at $20/person. A portion of proceeds goes to San Francisco Pride. A pack drops at 7:30 pm at Cow Palace. See Events page for more details. 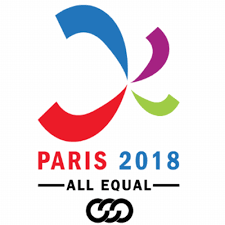 Gay Games Sports fee increase – Save $10 by registering your track events by the end of this Tuesday, Jan 7. It will be increased from $80 to $90. Have a great rest of the weekend everyone, and see you next week!